The short answer, Amrit, is that it is very helpful but should be no substitute for personal research. A picture is useful because it answers questions that the tailor may forget to ask you or you may forget to tell him. It may also help steer him away from a house style. But if you’re not careful, he may take too many cues from that photo – you have to tell him what you don’t want as well! Let’s start with an example. The E Tautz suit you like (link) is quite shaped, nipped in at the waist with a jacket slightly on the short side. The trousers are also very short and the sleeves are pretty narrow. If you go to a tailor and give him a long list of requirements – 4×4 fastening, three-inch drop to the lapel from the shoulder seam, 2.5-inch wide lapel, patch pockets (side and chest), working cuffs, half-lined, one rear (buttoned) pocket on the trousers, slanted side pockets on the trousers, roped shoulder, flat-front trousers, uncuffed – you may feel you’ve covered everything he could possibly want to know. It’s such a long list. But you’ve forgotten to mention the jacket length. He doesn’t know, forgot to ask (perhaps because he has a standard he normally works to) and now can’t ask you. But he has the photo. So he can check that, get an idea of your aesthetic and go for something close. Having a photo is also useful to avoid that house style or standard that he might work to. 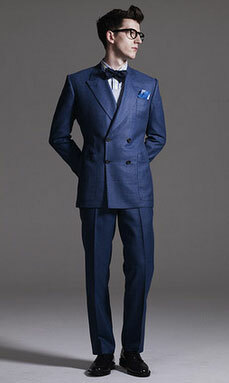 Asian suits, for example, tend to be boxy, big in the waist and wide of trouser. If you don’t specify a width to the trousers, he might cut them pretty wide. And even if you’ve specified a width, he might tend towards the more conventional (his conventions) to be on the safe side. Having an image reinforces your point of view and helps convince him that you know what you want. Give him this photo and you will not get a suit in a typical Asian cut. However, check carefully for things in the picture you may not want. I commissioned a Norfolk blazer (an invention, really) a while back from my tailor in Hong Kong, and gave him an image to get an idea of the belt I required (link). Unfortunately, he also copied the front corners of the jacket – making them square rather than rounded. That had to be changed at late notice. Equally with this suit, I doubt you want your trousers quite that short. They’re not even resting on the shoe; they’re a good inch above. Have you thought about whether you want your breast pocket to be patch as well? It’s not a style I like. So use a picture, yes. But look at it very carefully and make sure you know what you don’t want from that style. There’s no substitute for personal research and knowledge. You can follow the discussion on Reader question: Taking pictures to the tailors by entering your email address in the box below. You will then receive an email every time a new comment is added. These will also contain a link to a page where you can stop the alerts, and remove all of your related data from the site. Being based in Seoul, Korea, I know what Simon’s talking about when he speaks about trousers being baggy and huge in the seat. As it was my frist time to the tailor here in Seoul, I was nervous I’d get the Asian style trouser. My remedy? I brought in my favorite off the peg pair and left them with the tailor as a guide for fit, cut, etc. I changed a few details from the off-the-peg pair, and when I got them back they were exactly how I’d hoped. Pictures are great, (the jacket was modeled on a photo I brought in), but also consider bringing a model for the tailor to work from for more security.